UNSW@Home is our RoboCup@Home team. Our team is a joint venture between the School of Computer Science and Engineering and the Creative Robotics Lab, Art & Design. We competed in RoboCup@Home in 2017 and 2018. We hope to compete in the 2019 competition in July, especially since this will really @Home, since RoboCup 2019 is being held in Sydney. We are building our software infrastructure from our long history of research in autonomous robotics, and our previous participation in the RoboCupRescue league. 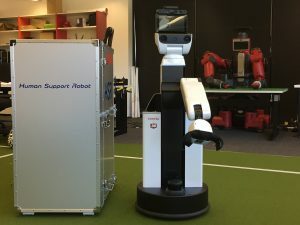 We are very pleased that we were awarded a Toyota Human Support Robot (HSR; pictured). Our team consists of academic staff, research staff, postgraduate research students, and undergraduate students from UNSW. Many of these interests are applicable to RoboCup@Home. We will be bringing our expertise in these fields to the software we develop for the competition. B. Hengst, C. Keith, M. Pagnucco, D. Rajaratnam, P. Robinson, C. Sammut, and M. Thielscher, A framework for integrating symbolic and sub-symbolic representations. 25th International Joint Conference on Artificial Intelligence IJCAI-16. New York, New York, USA, 2016. D. Rajaratnam, B. Hengst, M. Pagnucco, C. Sammut and M. Thielscher. Composability in Cognitive Hierarchies. Proceedings of the Australasian Joint Conference on Artificial Intelligence, 2016. T. Wiley, C. Sammut, B. Hengst, and I. Bratko, A Planning and Learning Hierarchy using Qualitative Reasoning for the On-Line Acquisition of Robotic Behaviors. Advances in Cognitive Systems. 4, pp. 93-112, 2016. C. Schwering, T. Niemüller, G. Lakemeyer, N. Abdo, W. Burgard. Sensor Fusion in the Epistemic Situation Calculus. Journal of Experimental & Theoretical Artificial Intelligence, 2016. B. Andres, D. Rajaratnam, O. Sabuncu, and T. Schaub. Integrating ASP into ROS for Reasoning in Robots. International Conference on Logic Programming and Nonmonotonic Reasoning, 2015. Additional publications are listed on pages on the research interests of our group. 2017 is the first time that UNSW will seek to qualify for RoboCup@Home. However, we have a history of participation in RoboCup spanning the RoboCupSoccer SPL, RoboCupRescue and RoboCupSoccer 4-Legged leagues. Our software from 2018 can be found here: http://robolab.cse.unsw.edu.au:4443/toyota-hsr/robocup2018.